Rally to us, ALIPAC activists! 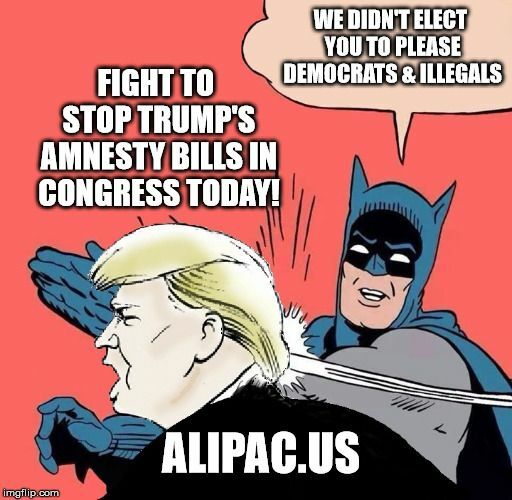 "No compromise deals with Democrats and illegal aliens to give DACA Amnesty! End DACA Amnesty now. Please tell Senator _______ to oppose the End The Shutdown Act and the Bridge Act Amnesty bills. Any form of Amnesty for illegal aliens, including DACA & Dream Act Amnesty harms our borders and brings in more illegals and will eventually give the Democrats a monopoly over US elections and government." You can quickly find all of the numbers you need at this link, remember to call, call, call (Leave messages if you must) and then follow up your calls with a written message. You are leading the charge against Amnesty once again today! Please reply to this email with any questions, feedback, or reports about your call progress! Last edited by imblest; 01-22-2019 at 01:40 PM. You say to call, call, call the senate and to do so you say to "click here" but when I click there, it just brings me right back to your original post. Hi Americandrum. You may use this link "Contact Info" from Alipac post to locate numbers to call. 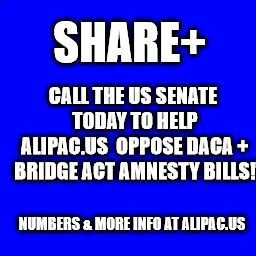 Call, call, call now to stop DACA Amnesty!